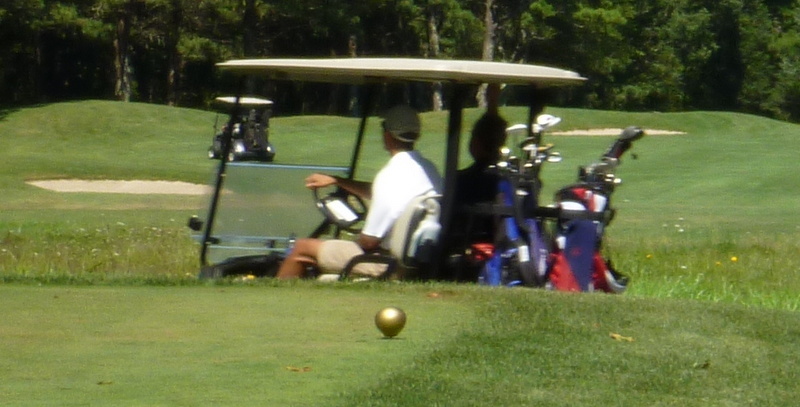 Making the turn, Farm Neck Golf Club, Oak Bluffs, Massachusetts, August 11, 2013. The thing the guy in the blue shirt is holding isn’t an attache case. I knew the President was about to arrive on Martha’s Vineyard because my cell-phone reception suddenly went from no bars to three. The Obamas are staying about two miles down the road from where my wife and I are staying, and because their house is close to the road all traffic is being diverted around it. That has made the road much quieter than it usually is—a second benefit. 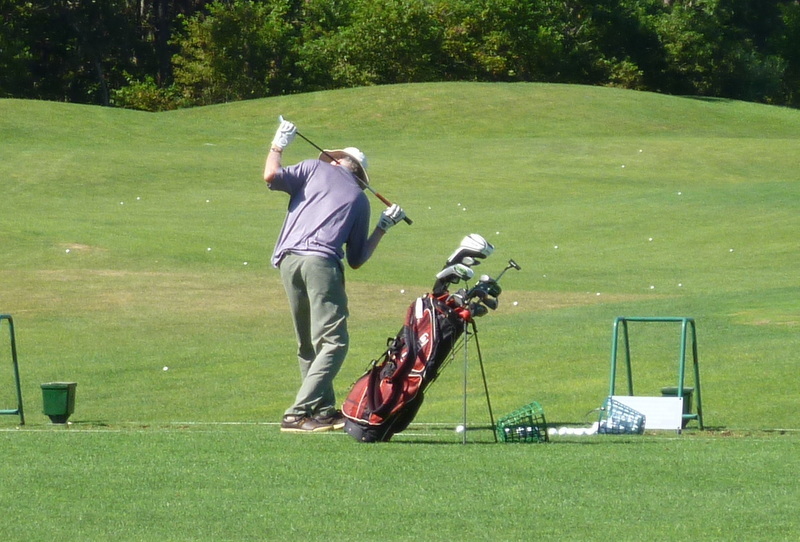 And this afternoon Alan, Leslie, Wendy, and I played golf nine holes ahead of him, at Farm Neck Golf Club, in Oak Bluffs. Leslie, twelfth hole, Farm Neck. 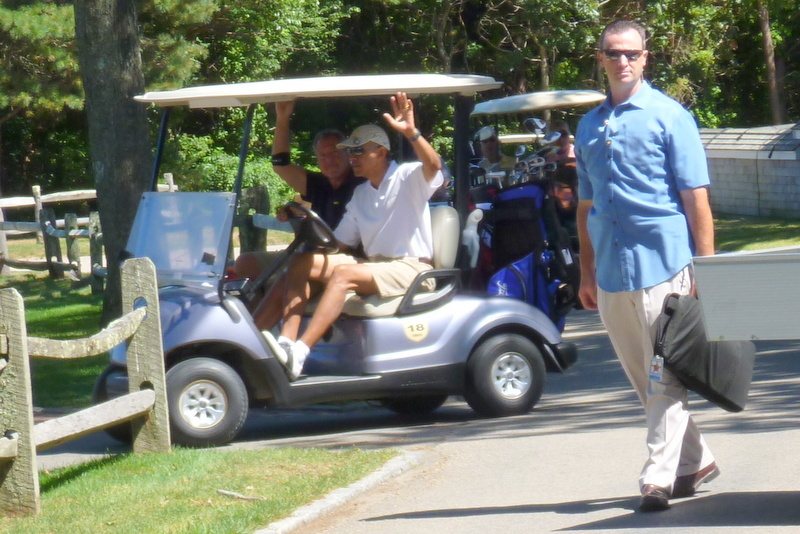 We finished just before the President made the turn, and we stood near the cart path leading to the tenth tee, hoping to see him. While we waited, a Secret Service guy searched my golf bag, had a look at the stuff in my pockets, and waved a metal-detecting wand over my back. 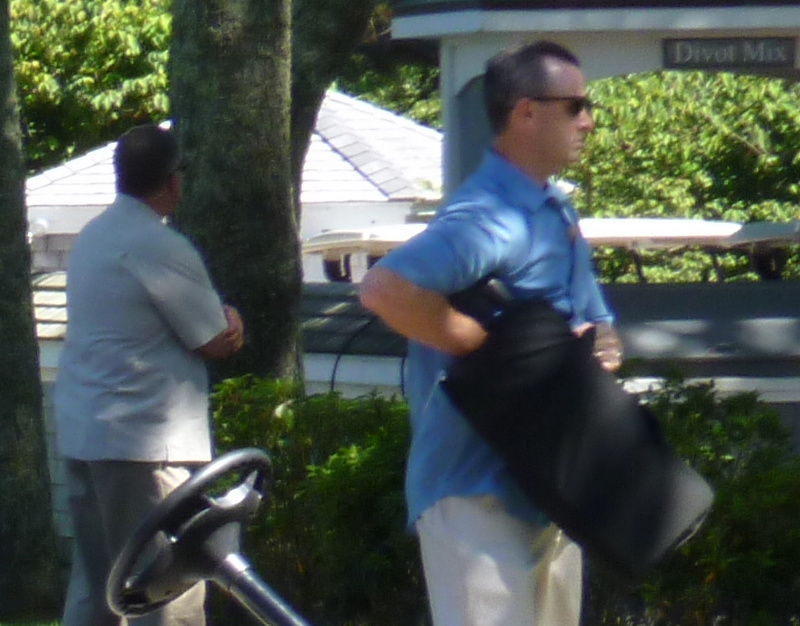 Two Secret Service guys keeping a close eye on the divot mix. 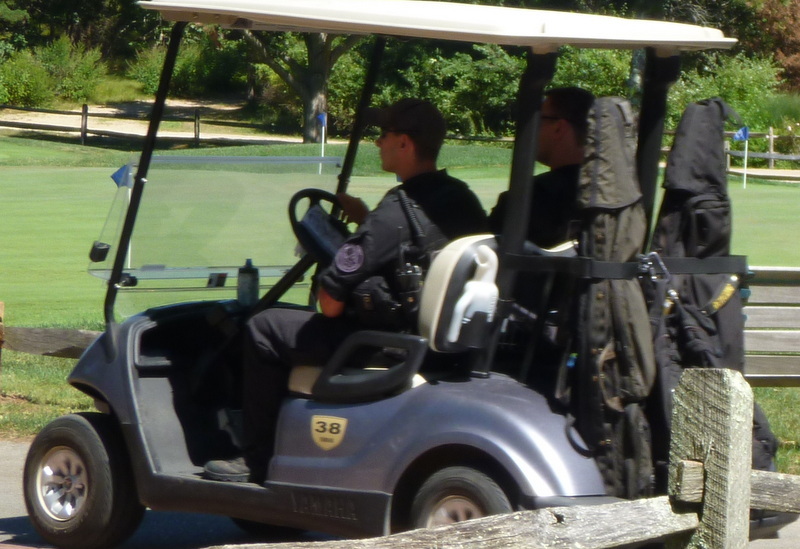 There were also lots of guys wearing bulletproof stuff and driving around in golf carts. 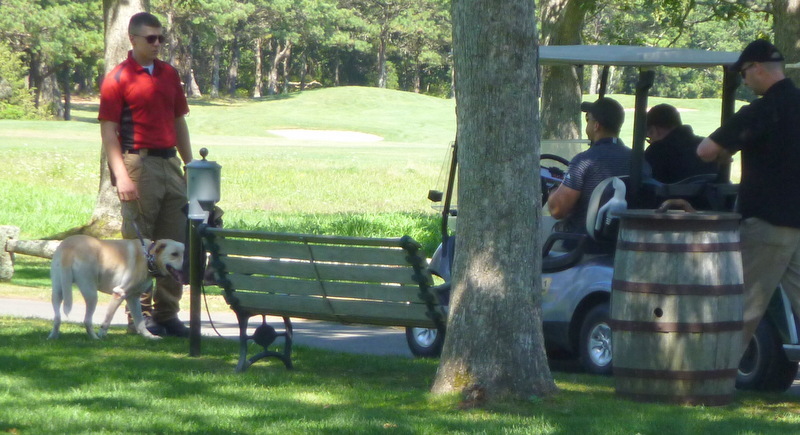 The things strapped to the back of their carts were not golf bags, presumably. I could see lots of Secret Service guys, and one of them told me that there were lots more I hadn’t noticed: on boats, in kayaks, on paddle boards, in the woods. The ones I could see were wearing sunglasses, ear pieces, microphones, and little star pins near their shirt collars, like miniature badges. Their eyes were constantly moving. They also had a bomb-sniffing dog, and they checked absolutely everything—including a wooden trash barrel that looked like the sort of place where Wile E. Coyote might try to hide from the Roadrunner. Note the coyote-height eye hole in the trash barrel. 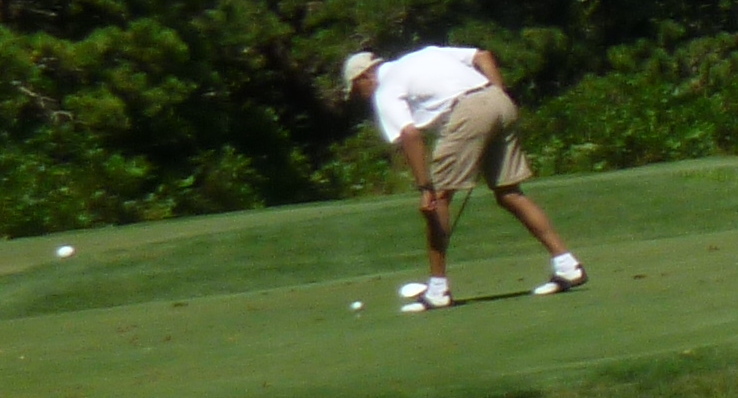 The President was playing from the blue tees—just as I had done! This entry was posted in Golf Courses, My Close Personal Friend and tagged Farm Neck, Larry David, President Obama by David Owen. Bookmark the permalink. 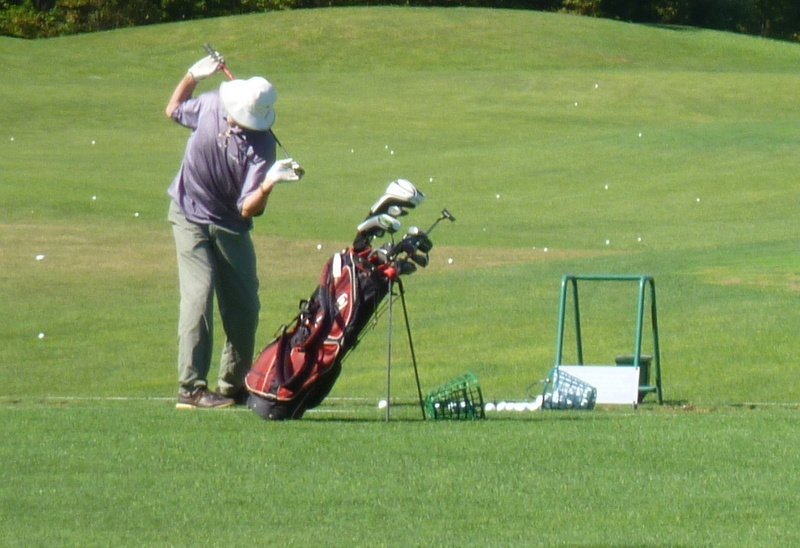 If Larry two-gloves would incorporate the Angel Jimenez knee twisters, he’d be completely limbered up. By the way, I am a convert to the rain gloves for hot, humid days in Georgia and wear two if need be. Might not buy a standard glove again. Loved the post, but not sure I would want to be that close to obviously very grave danger.